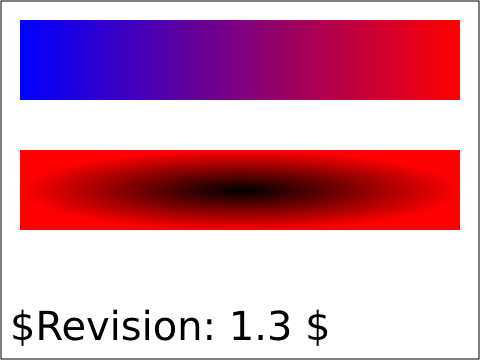 Test linear and radial gradient defaults. Includes testing defaults for linear grad x1,y1,y2 = 0%, x2 = 100%. and testing defaults for radial grad cx,cy,r = 50%, fx,fy = cx,cy. The top rectangle must be blue at the lefthand side and red at the right hand side, fading smoothly accross. 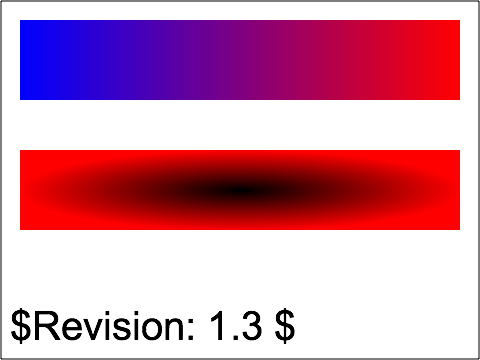 The lower rectangle must be red at the edges with a black centre to the radial gradient at the centre of the rectangle, and the gradient occupying the whole rectangle.